Don’t ski while talking on a cell phone, it’s like driving while texting. Skiing and riding require your full attention. Cell phones should only be used as a communication device to hook up with people you are skiing with, not for blathering to your buddy at home while booking down the hill. How about pulling safely off to the side of the trail to make or take a call? Please refrain from long, loud extended conversations on the chairlift when in the company of others – surely that conversation can wait. Don’t crank your iTunes, blaring over your chairlift companions’ conversation. Besides common courtesy, if you are so tuned out while skiing, you may not hear the approaching snowmobile or groomer. Also, please, no speaker phone – should go without saying?! Don’t ski above your ability level. It is okay to challenge yourself but it is not ok to endanger yourself or others by skiing out of control and being unable to stop, turn or avoid others. The trail designations, green circle, blue square and black diamond, etc., are there for your benefit. 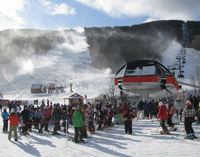 Work up to each level and remember that trail designations are unique to each ski area, the level of difficulty typically refers to their trails – so a black diamond at Stowe is more difficult than at Bretton Woods. Don’t bomb straight down the trail just to reach the Terrain Park, make the most of your run, and your time in the park. Maybe it is just me, but I find it rude and reckless when park skiers just beeline to the park, cutting skiers off, then smear a big skid stop, producing a huge snow cloud to finally check their speed before the park entrance. Don’t bomb through the Terrain Park, even though the best untouched cord lies on the sides. Whether or not you are using the elements; you must respect the other riders’ turns and allow for safe intervals. Know the Code and be aware of Terrain Park etiquette so that you are heads up as to who is hitting what element, who is next, when to call your drop, and keep landing areas clear for the next jibber. 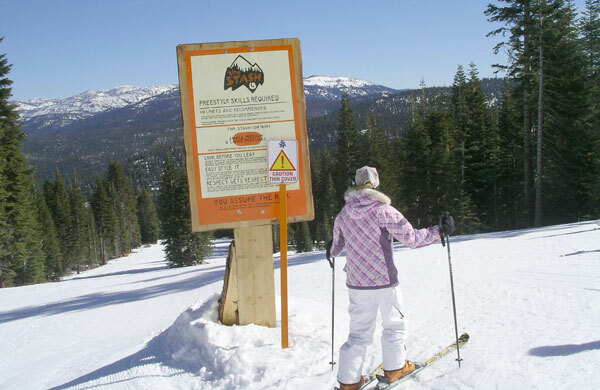 Racers, the ski area does not exist solely for your run. Cutting lift lines and carving huge trenched arcs on your way to the race course with no regard to other skiers (people who paid full price for their lift privilege) is not very cool, despite your expensive spandex suits and razor sharp skis. Assuming you are god’s gift to skiing is ill advised. Very few of you, like .5%, will become the big leagues like US Ski Team’s Bode Miller and Lindsey Vonn, the rest will join the ranks of recreational skiers and hopefully find racer behavior annoying. Lift lines: don’t enter the lift corrals until you are ready to ride said lift. Standing with your board or skis blocking the entrance jams up the flow. Floundering with your gear, trying to find your group, digging for your ticket to show the liftie, and missing chairs makes you look like a “Joey on skis” – see our ski slang guide for your ski vocabulary. Causing the lift to stop because you do not slide out in time for the chair will not win you new ski friends. Don’t attach your lift ticket to the front zipper of your jacket. It looks ridiculous, and worse, it whacks you in the face as you ski. Don’t be a gaper; avoid the big gap between your goggles and helmet, or your hat and helmet – it looks silly and will subject your forehead to the cold, wind, sun, and ridicule. Don’t assume you can just pick up the sport. Get a lesson, instead of teaching yourself to ski or getting a few pointers from your buddy. The money spent on professional instruction will reduce your risk of injury, improve your lifelong enjoyment of the sport of skiing, and accelerate your proficiency in the sport of skiing or snowboarding. We can all spot a self taught skier by their technique (or lack of actually).